Easy Thanksgiving crafts for children that works as a Halloween craft too! Thanksgiving crafts for children are always a popular tradition! Here are the easiest homemade Thanksgiving table decorations that they can actually do themselves – no scissors, no glue, no mess and no fail… even a toddler can make this easy craft. It is an adorable pumpkin made from a roll of toilet paper! I can’t take credit for this idea, my awesome sister-in-law Darcy got it from her grandson’s teacher! So it’s even teacher-tested and we've added ideas to tie this craft into the curriculum! You can make these with the kids to celebrate Fall, Halloween or Thanksgiving! Plus we have included funny free gift tags if you want to gift these for either Halloween or Thanksgiving! 22 x 18” fabric square in a festive fall-colored print. Short on time...you can buy “Fabric Quarters” at fabric stores already pre-cut or order on Amazon these 12 Fat Quarters in orange patterns like this .. If you get a yard of 44 or 43" wide, you can cut 4 squares. A branch from the yard or popsicle stick that forms the stem. I found these cute sticks with shapes on them at the craft store. Just use a brown magic marker to color them! Ribbons and tulle to tie around the popsicle stick/branch. We added cute jeweled leaf stickers to decorate the shaped top! Give an index card and have them write what they are most thankful for, then punch a hole, and tie it to the pumpkin. Or add our free funny gift tag below that you can print for free. One of my all time favorite boys shows us how you put everything together to make these adorable Thanksgiving crafts for children. Lay out the fabric and place the roll of toilet paper in the center. Grab the corners of the fabric and one at a time, stuff them into the center of the toilet paper roll.. just squish them into that cardboard ring! Your pumpkin is done, now grab your popsicle stick "stem" and tie on some pretty ribbons, then add the sticker. Then push it right into the middle of the toilet paper roll! You can also use a branch right from your yard instead. This year we adults made them early and gifted them with the tag as an early Thanksgiving treat to our friends. You can only imagine the laughs from our friends! The poem was priceless! These toilet paper pumpkins are a great Halloween craft too! Calling all teachers.. turn this craft into a lesson! Here is a creative way to tie this pumpkin making craft into a pumpkin lesson plan. Tie to it to science or math using either of these 3 books as a read aloud and discussion! More ideas for your Thanksgiving celebration.. Thanksgiving desserts, Turkey trivia games and fun Thanksgiving dinner table favors! 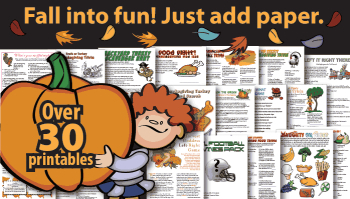 Plus more Thanksgiving crafts for kids! Here is a creative Christmas craft idea.. you will need to help by controlling the glue gun, but the kids can pick their colors for the earmuffs, make the eyes and nose and choose the ribbon for the scarf!